Top chefs from across Dorset and Hampshire came together to enjoy an afternoon of cookery demonstrations, networking and Clayzer at Rhinefield House, Brockenhurst on Monday (June 19). The event was kissed with glorious sunshine and took place within wildlife-abundant utopia that is The New Forest. 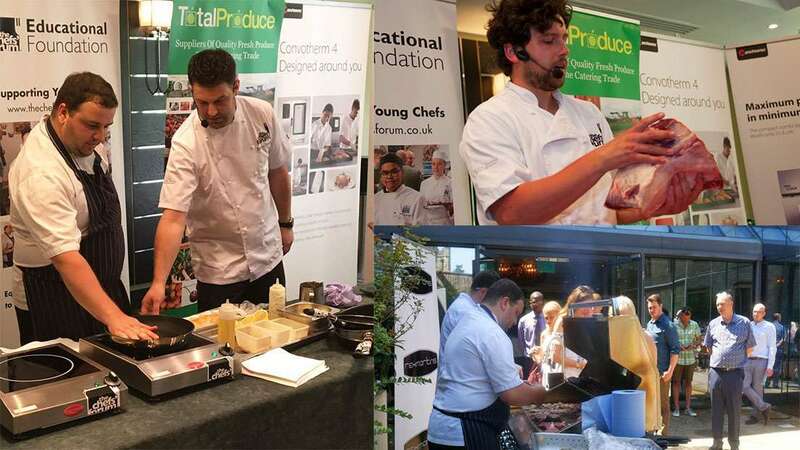 The event gave chefs the chance to network in a peaceful rural location and meet leading suppliers whilst showcasing HIT Training learners currently on work based training programmes at Rhinefield House – a national account for HIT. The visiting chefs were treated to a delicious canapé and fizz reception where Executive Chef Byron Hayter and his team of HIT Training learners showcased produce from Chefs’ Forum Sponsors Walter Rose & Sons, Total Produce and Kingfisher Brixham in mouth-watering canapés. Executive Chef Byron Hayter has been using HIT Training in both his previous role at Eastwell Manor and now at Rhinefied House, part of the Hand Picked Hotel Collection CDP Ionut Negrei joined Byron on the demo stage to cook a duo of delicious dishes showcasing Kingfisher Brixham Scallops, Turbot and Walter Rose Pig Cheeks. Byron and Ionut brilliantly executed a dish of Scallops with pomegranate and cauliflower, then Pigs cheek with turbot, beetroot and shallot in front of an audience of forty top chefs who attended. This was followed by a presentation on beef butchery by Jack Cook of Walter Rose & Sons showing how to cut different steaks and utilise all hindquarter meat from the rib to the rump of the cow. The fantastic array of steaks: Chateaubriand, bavette, spider, fillet, rump, rump tail, picanha and ribeye all made their way onto the shiny new Rexmartins alfresco modular kitchen where they joined beautiful king prawns , sea bream and sea bass from Kingfisher Brixham. The chefs enjoyed a well-deserved surf and turf BBQ on their day off! The event ended by giving guests the chance to show off their shooting skills by taking part in a game of Clazer shooting with a prize awarded to the chef with highest number of points. The winning chef was Ashley Randle of The George Hotel in Yarmouth on the Isle of White who won a day of butchery with Walter Rose & Sons at the cutting plant in Devizes, Wiltshire.